Glacier, mountains and the lake – The region of alpine sights Zell am See-Kaprun is right in the heart of Austria. There is no other destination that offers so many spectacular places for excursions and alpine sights located as close together. Mighty mountains, mellow pastures, the glistening expanse of Lake Zell, the eternal ice of the Kitzsteinhorn glacier and the untamed forces of nature. The region offers a wide choice of activities, entertaining family fun, tranquil scenery as well as culinary and cultural discoveries. Glaciers, mountains and lake – the Austrian town of Zell am See-Kaprun combines all aspects of the Alps and is a place to visit all year round. These include the summit world 3,000 on the Kitzsteinhorn, the unique glacier ski r area, the Maiskogel family region, the Schmittenhöhe local mountain, the crystal clear Lake Zell.Tradition and authenticity are reflected in the events and culinary specialties in the region. Guests can find relaxation in the 20,000 square metre water and wellness world in the Tauern Spa and in many other traditional pampering hotels. The Kitzsteinhorn summit station is situated 3.029m above sea level. It is the highest point comfortably accessible for everyone in the county of Salzburg.On Salzburg’s highest and most spectacular panoramic platform, visitors have a breathtaking view to the valley of Kaprun. The Gipfelwelt 3000 allows you to savour the entire fascination, energy and grandeur of high alpine nature. In the CINEMA 3.000, the highest cinema in the Alps, a movie of the nature is shown on a panoramic screen. Here visitors can marvel at the beautiful impressions of Kitzsteinhorn throughout the seasons. The magical-mystical path of the 360-meter-long NATIONAL PARI GALLERY gives some extraordinary insight and views to the Hohe Tauern National Park. All year-round Austria’s oldest national park can be explored in organized excursions with NATIONAL PARK RANGERS that are familiar with the region On Kitzsteinhorn Glacier you can refresh yourself in summertime at the ICE ARNEA with slippery slides or relax at the snow beach. 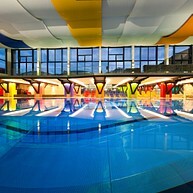 The Zell am See Leisure Centre offers you individual wellness pleasure. The indoor pool with a 74m long water slide, diving platforms and comfortable relaxation areas is located directly next to the indoor ice rink in Zell am See. For children there is a special 33m² dchildren's pool with pirate ship game. Rest & relaxation are on the agenda in the sauna area with organic sauna, infrared cabin or the finnish sauna.
. The Zell am See Casino is located in the famous, venerable and befitting Grand Hotel directly at the promenade of Lake Zell. Unique casino flair can be enjoyed on over 800 m2. 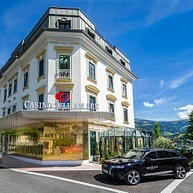 Select from a varied international range of games: 53 slot machines, 12 Easy Roulette terminals, 5 American Roulette tables, 3 Black Jack tables, 2 Easy Hold'em poker tables, 1 Maccau Baccarat table The Zell am See Casino does not only stand out because of its modern gambling facilities and professional game processing. It is especially the high-quality service and the wonderful bar weith a great variety. Allow yourself relaxing moments in the Tauern Spa. 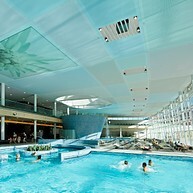 Stretching across 20.000 m2, the spa, aqua & sauna world never feels overcrowded. 13 saunas and 12 pools guarantee you a fantastic chill-out place. With a water surface of 730 m2, the indoor aqua world is perfect for enjoying pleasant evenings. The outdoor saltwater pool offers 810 m2, including activity pool and 25-m sports pool. Relax in the sauna world of the TAUERN SPA with Finnish sauna, backer's oven sauna, herbal bath, organic sauna or saltwater laconicum. 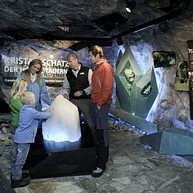 In the "Kidstein" children's area, there is a lot to experience and explore for small explorers. In the outdoor water park, there is a play pool, a baby pool and a youth pool for the teenager. Culinary delights are a must at a place where you relax, unwind and are sporty active. Several restaurants treat you and your palate to specialities. The Hotelrestaurant Lichtblick, the Thermenrestaurant Genussallee or the Saunabistro Heißkalt serve regional specialities or light, healthy cuisine matching your wellness experience perfectly. The castle was built in the 12th century - proven by Roman criterion in the east tower. In the gebinning the castle was owned by Graf Falkenstein or Graf Peilstein. Today, Kaprun Castle is a much appreciated and popular event venue. Fantastic events are staged at the Kaprun Castle throughout the year. Most notably is the annual Medieval Festival in summer which gives the impression that its participants have arrived by using a time machine. VINTAGE CARS AND THE MOST FAMOUS PASS ROAD Old but not forgotten vehicles have a place in the region where they can be admired in a dignified setting. The passionate vehicle enthusiast and proprietor has created a magnificent world of technology in the Vötter's Vehicle Museum in Kaprun. The journey through the history of automobiles at Vötter's starts in the 1950s. The exhibition includes cars, motorbies, scooter, tracotrs, old Kitzsteinhorn cable car and the biggest convertible in the world. The exhibitions include prehistory of the almost 4.000 year old Kaprun village, pioneers of tourism and the modern tourism. Every year there is an additional special exhibition. The region's touristic value and the creation of a desirable basis of life in the post-war years are based on interesting processes, much work and know-how. WW II as such was an important period for the development of Kaprun as it is today as this chapter of history greatly influenced the building of the power plant at the Kaprun High Mountain Reservoirs. More about this and about the special exhibition Kaprun and its Artists can be found out at the Kaprun Museum.